Nordic Events in Full Swing! 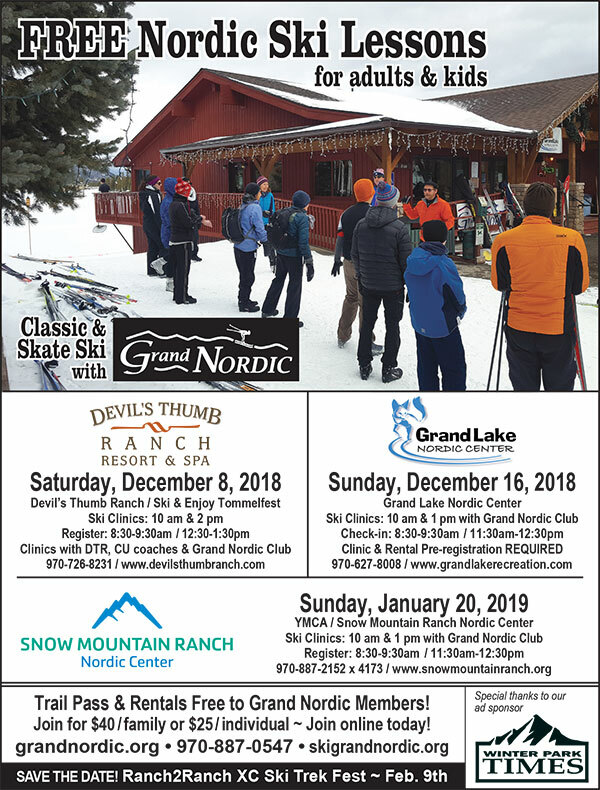 Nordic season is is full swing in Grand County and there are a ton of great events coming up that you don’t want to miss out on. The Grand Lake Classic is back! Join Grand Lake Nordic Center for the 3rd in a series of Classic style races in Grand County. A 1.5 or 3 km kids race will begin at 9:30 a.m. and your choice of either 8 km or 16 km race will begin at 10:00 a.m. Cost for this event is $10/kid & $20/adult or $50/family of 4 or more. Enjoy food and drinks provided by local breweries and restaurants and the views of Rocky Mountain National Park. Click here for more information. Grand Nordic offers free skate and classic Nordic ski lessons to everyone, no matter your age or skiing ability. On January 20th, the free ski clinics will be held at Snow Mountain Ranch at 10am and 1pm. Be there early to register. Day of trail passes and rentals are free to members. Click here for more information. The Grand Nordic Ranch2Ranch Trek will be held on Saturday, February 9, 2019 at Snow Mountain Ranch Nordic Center. The race will begin at the Snow Mountain Ranch Nordic Center and will finish at Granby Ranch and is for cross-country skiers and snowshoers. This race benefits youth XC skiing in Grand County. Park at the Montana Lot at Granby Ranch and take the shuttle bus to Snow Mountain Ranch at either 8:30am or 9:30am. The Ranch2Ranch Trek features a 12 K un-timed event on the marked and groomed trails from Snow Mountain Ranch to Fraser-Granby Trail to Granby Ranch. Price is $40 for Grand Nordic Members, $50 for non-members, and an additional $5 day of race and includes a BBQ lunch at the end. Click here for more information.